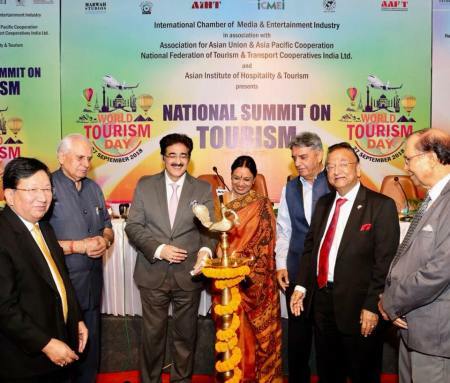 Noida: A grand event to celebrate Tourism of India and to discuss the prospects of tourism in relation to rest of the World, a National Tourism Summit was organized by International Chamber of Media And Entertainment Industry in association with Asian Institute of Hospitality and Tourism and Association of Asian Union at Marwah Studios at Noida Film City. The summit was inaugurated by the former Governor of Manipur H.E. Vinod Kumar Duggle, former Governor H.E. Amolak Rattan Kohli along with L. P. Potsang President of Global World of Music And Arts Organization, Subhash Goyal President of All India Travellers Agent Association, Padma Shri Bharati Shivaji renowned dance exponent of Mohiniyattam and Dr. Beni Prasad Agarwal Chairperson Association of Asian Union. “We are associated with tourism since we are in cinema. Twenty-five years back we gave a new word of Film Tourism to the English dictionary, it has become one of the most popular words in tourism industry now. Marwah Studios has attracted two million people in all these years under film tourism,” initiated the summit by Dr. Sandeep Marwah President of Marwah Studios. “India has grown much bigger In Tourism Industry in last few years. We have grown from six million to ten million tourist in last few years but still a lot has to be done to attract many countries,” said Subhash Goyal veteran of tourism industry. L.P.Potsang and Padamshri Bharti Shuvaji touched the subject of culture whereas Governor Vinod Kumar Duggle expressed the need to bring in changes in day-to-day affairs to make tourism industry more vibrant. Governor Kohli introduced some new ideas to make Indian Tourism more popular within country and with foreign Nations. The first session finished with question answers. Later Sandeep Marwah honored the guest with memento and life membership of International Film And Television Club of AAFT.